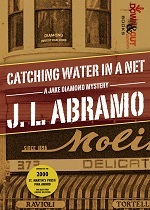 In this award-winning debut, San Francisco PI Jake Diamond is a hero who plays both sides of the Private Eye street. He is a careless dresser with a sloppy lifestyle and he couldn’t keep his marriage from falling apart. But he also epitomizes the best of the modern shamus. He has the kinds of friends a man in his profession needs-jailbirds, mob bosses, and a cop who can surreptitiously run license plate numbers for him. Jake has been down on his luck lately, barely making enough money to pay the bills and it looks like business might finally be picking up. A woman comes to his office begging him to find her missing husband who has been accused of murder. Jake remembers that his mentor Jimmy Pigeon always says “Whenever I’m asked to locate a missing spouse, the words ‘no, but thanks for asking’ always come to mind” and almost turns the case down, but then he learns that the murder victim was Jimmy Pigeon. Determined to discover the identity of Pigeon’s killer, Diamond scrambles between Los Angeles and San Francisco following leads that range from weak to delusional. With the help of his trusty and sarcastic assistant, Darlene Roman, compulsive gambler Vinnie “String” Stradivarius, and Italian-American “businessman” Joey Russo, Jake slowly uncovers the motives behind Pigeon’s murder. Jake’s adventure has all the components of a great private eye series-scares, suspense, lots of laughs, a few tears and a big surprise at the end.